This is the central point of contact for all N54 JB4 related information. Anything from install directions, to firmware updates, to settings, to frequently asked questions. Any and all relevant info is linked in this post. If you come across something missing from here be sure to let us know. Order the full N54 JB4 system here. The latest JB4 ISO firmware is posted here. For the full JB4 Install Guide click here. Map 2: 14.5psi. Suggested for those with intake and other bolt on modifications with 93 RM2 or higher octane. Map 3: Progressive WMI water injection mapping with failsafe. Map 5: Autotuning map. Boost ranges between 12-17psi based on your cars octane, conditions, and modifications. E85 compatible. If using E85 we suggest around 30% to start. Refer to the E85 FAQ for addl info. Resets to 93 octane level adaptions when selected and adjusts itself up or down from there. Map 7: Race gas map. 18.5psi peak boost on the G5 ISO. Requires straight 100-104+ RM2 octane unleaded racing fuel. Never run leaded fuel. To use this map with E85 requires the E85 back end flash, inline booster fuel pump, and a 40%+ E85 mix, per E85 FAQ. Map8: Valet low boost map. May trigger 30FF under boost code in cars not also equipped with the back end flash map. 1) Steering wheel controls menu and video is in the 3rd post down. 2) JB4 has cold/hot oil protection built in. So expect stock like boost until oil temps are > 160 degrees. Same goes for oil temps > 280 degrees. 3) The JB4 has several safety systems built in that will force a switch to map 4 (low boost) if the JB4 notices various conditions. Including boost over target, fuel pressure below target, and air/fuel ratio running lean. If you ever encounter an automatic switch to map 4 review the FAQ below for addl information. Those racing on lower grade fuels, running strong E85 mixtures, larger than factory turbos, or those interested in doing custom mapping will want to consider a back end flash. A) Update your firmware to the latest version in the post below. B) Update your settings (on the user adjustment page in app or interface) to the last settings in the post below. Certain settings particularly duty bias and boost by gear are often missed causing under boosting and headaches. C) If you are running the STOCK flash map (you'd know if you aren't) then be sure to set menu4 in dash to 3, so the JB4 knows you run the stock flash map. If you set menu4 in dash to 2 the JB4 will presume a back end flash map is loaded and if its not the car will boost poorly, trigger 30FE faults, etc. Support requests and bug reports are generally deleted or moved from this thread without being read. If you require assistance from BMS email us at jon@burgertuning.com. Otherwise for log and tuning support post logs, details, and fault codes in n54tech's support section. Can I use E85 ethanol fuel with the JB4? If so what mixture should I use? 1) Generally speaking you can run 30-40% E85 without the need for logging or worrying about fuel trims, fuel pressure, etc. Just mix E85 in and select map 5. Done. 2) For those wanting to run higher mixtures (and more power) then you need to datalog. You'll want to first look at your low fuel pressure in the JB4 logs. If that is dropping below 50 then you're maxing out the low fuel pressure and should either reduce the E85 mixture or add a Fuel-IT Stage1 fuel pump upgrade. 3) Next up look at fuel trims. If they are exceeding 50 in the JB4 logs & open loop is already at or above 90, or if you get 29F2 codes from having too high of an open loop, then you need to add the a back end flash for E85 fuels to extend the fueling range. The E85 flash also features VANOS changes, higher than factory timing advance, and some other stuff designed to help make more power on E85. 4) Finally after the flash and low pressure pump, you need to keep an eye on the high pressure pump. If it drops below 9 @ wide open throttle then you're maxing out the high pressure pump and need to lower the E85 mixture or lower the boost in the areas where it's dropping below 10. Alternatively you can add in a port injection kit, meth kit, or TBI injection kit, to augment the high pressure fuel pump. 5) Most cars will need an inline fuel pump upgrade OR meth to run more than 50% E85. We suggest this inexpensive inline option. 6) Using map 7 requires 50-60% E85, the back end flash, AND the fuel pump upgrade. What is a JB4 back end flash map? The BEF are maps you load on to your DME using the MHD or BimmerBoost N54 flashing systems that are specifically designed to work with the JB4 system. These maps work with the JB4 piggyback to adjust fueling, timing, VANOS, and other functions on flash side while allowing the JB4 to retain its superior absolute boost control, on the fly map changes, in dash gauges, shift light, auto learning/self tuning, gear dependent boost control, data logging, WMI control, 2STEP/NLS, etc. It's simply the best of both worlds and greatly eliminates the need for expensive and time consuming "custom tuning". Note BMS is not affiliated with BimmerBoost or MHD, does not provide flashing tools, and no support is provided beyond the free base maps posted for each platform. Contact BimmerBoost and/or MHD directly for flashing support and additional information as needed. How long does it take for map 5 to adapt? Map 5 is designed to be continually adapting particularly focusing on the last three minutes or so of wide open throttle activity. Upon selecting map 5 it will default to "93 octane" levels (approx 14psi peak) and adapt up or down from there. Those running E30 mixtures will see the tuning become more aggressive (higher boost, higher timing, leaner AFR) during subsequent wide open throttle pulls while those running lower octane mixtures such as 91 octane will see the tuning become less aggressive (less boost, less timing, richer AFR) during subsequent wide open throttle pulls. It's important to note the map learning is always active. So should things take a turn for the worse during a run (intercooler outlet temps rising, oil temps rising, increased engine knock, etc) the tuning will respond accordingly. What do menu 4/2, 4/3 and 4/4 in dash do and which one should I select? Menu4 allows you to tell the JB4 whether you are running on the factory flash tuning (4/3 DEFAULT SETTING), a JB4 back end flash map (4/2), or want to run flash only (4/4) with the JB4 providing gauges and/or boost targeting only. How do the JB4 various flex fuel inputs work? The JB4 can read ethanol mixture via a physical sensor (such as the Fuel-IT kit) attached to pin #15 or pin #2 on the JB4 harness. To enable this function select the appropriate option on the WMI page. Alternatively if neither pin2 or pin15 flexfuel inputs are selected, the JB4 will default to its internal virtual flex fuel sensor system. The virtual flex fuel sensor estimates ethanol content using oxygen sensor feedback while idling. For the system to work properly the "Virtual Offset" on the WMI page must be properly entered for the vehicle. This VO directly relates to the fuel scalar settings within the DME. For a stock DME not using our back end flash map, the starting point is 130. For those running our BEF the starting point is 140. To calibrate periodically check the reading and adjust the offset until the JB4 ethanol parameter converges what you estimate your ethanol to be. For example, on pump gas it should converge around E10. With 5 gallons of E85 and the rest pump, it should converge around E30. If upgrading from an old JB3 system or JB4 G4 how do I rewire my harness to be compatible with a new JB4 G5 box? Details are below and it takes around 15 minutes to perform. If after reviewing the guide you would prefer to pay us $25 to do the harness upgrade for you then select the appropriate upgrade kit from our site. We will hold your JB4 upgrade kit until you mail in your harness and box, modify the harness, and send the modified harness and JB4 box back to you. There will be a 1-2 week delay between when we receive your harness and return the modified harness. For directions on how to modify your old JB3 wiring harness for the JB4 (including the old pin out harness) click here. Install directions for JB4 G5 SLD wires and how to resolve 29D0 codes if doing a G4->G5 upgrade. What is menu 5 for? Why doesn't my speed move in increments of 10 when making selections? Upon installing the JB4 you'll need to use the menu 5 option to properly calibrate your gauges. Otherwise the numbers on the speedo, fuel gauge, and oil gauge won't align properly. You'll count up to 5 then set the tach based on your model and speedo type. 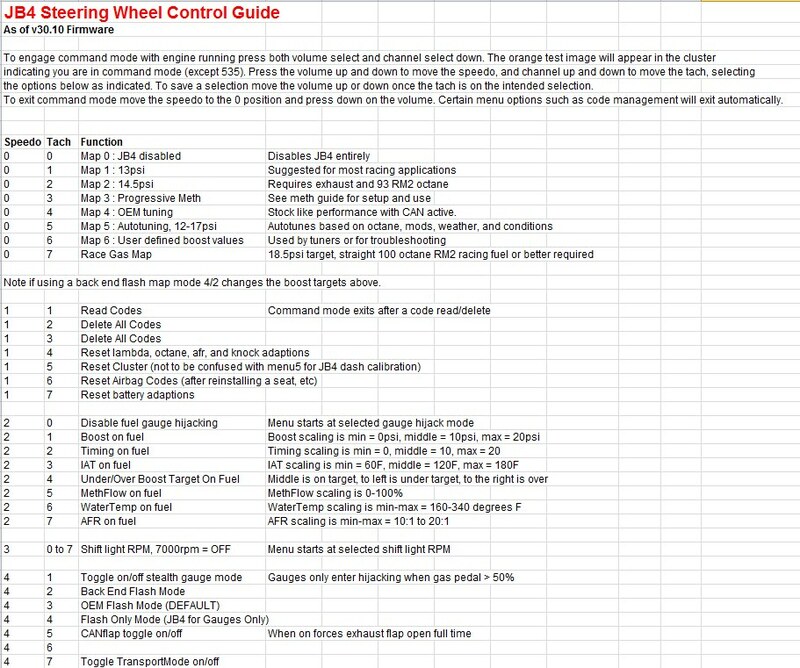 Refer to the link below for the steering wheel controls sheet. How do I read out and delete codes? If you find traction problems too severe in 1st, 2nd, or 3rd gear you can cap the maximum boost/torque achieved in those gears to aid with traction. You'll find them under user settings. A value of 10.0 in 1st and 12.0 in 2nd will limit boost to 10.0psi while in 1st gear and 12.0psi while in 2nd gear. When in 1st or 2nd gear under the boost limit you may hold down the steering wheel volume or talk button to bypass the limit while the button is held down. For example if doing a burn out at the track. How much boost can I run with a JB4? In most applications map1 or map2 should be used. For custom tuning the JB4 supports mapping up to 20psi, the limit of the factory TMAP sensor. For higher boost levels you will need to add in a 3.5bar TMAP sensor using a special adapter available on our site. Does the JB4 support larger than OEM turbos? Yes. The JB4 is able to control OEM turbos, hybrid vacuum operated turbos such as RB & Vargas, and single turbo retrofits such as MOTIV, VM, and FFTEC. Refer to the hybrid and single turbo threads for additional tuning information. I got a misfire code. What should I do? Misfire codes are very common on the N54 motor and are generally either a defective plug, coil, injector, or if the misfires happen across multiple cylinders could also be an o2 sensor or high pressure fuel pump. The higher the power levels the more apparent hardware weakness are so often they will crop up first at only higher power levels. Eventually though, they will come up at OEM power levels too. If your plugs have over 15k miles on them I'd suggest switching them out. If that doesn't do the trick you can switch the coil on the misfiring cylinder over to another cylinder to see if the misfire moves with it. If it does, then replace that coil. My SES light flashed and the JB4 switched to map 4 / low boost. What do I do now? The JB4 has several active safety systems that will trigger SES light flashes. The first is the over-boost safety. If boost exceeds the value you've set under user adjustment the SES light will flash once and the JB4 will switch itself to map 4 until you restart the car. The default setting is 18psi. Common causes for this are setting the value too low for the map/intended usage, improperly configured or defective wastegates, or JB4 setting problems. The second is the run-lean safety system. If your air/fuel ratio (either bank) runs leaner than 14:1 over 4500rpm for more than a second the SES light will flash twice and the JB4 will again switch itself to map 4 until you restart the car. 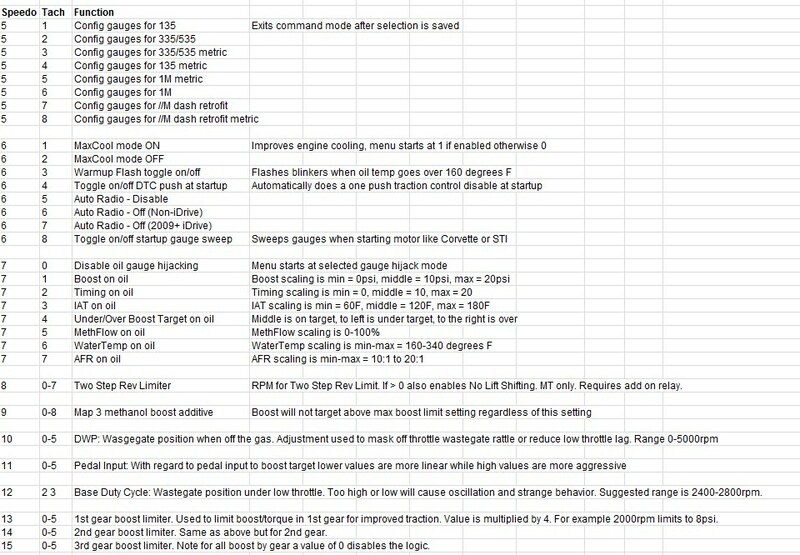 Common causes are maxed out fuel trims (see E85 notes above) or o2 sensor faults. Note any o2 sensor fault must be corrected for the tuning to operate properly. Another commonly triggered fault is low fuel pressure. If your high fuel pressure drops below 7 (~800psi) the JB4 will flash the SES light three times and switch to map 4 until you restart the car. Common causes are an inadequate low pressure pump, too strong of an E85 mixture for your tuning/fuel pump, or a failing high pressure pump. MaxCool is an JB4 algorithm that improves engine cooling by increasing the speed of the electric water pump and engine cooling fan as a function of water temperature. When enabled you may hear the very loud engine fan and water pump running more often including at idle. MaxCool can be left on full time if you desire and is compatible with add on oil and water coolers such as the BMW PPK kit. What are the user settings and which ones should I change? Most are there for diagnostic use only and should not be touched unless you are directed to by your tuner. The settings you might adjust are documented below. Boost Safety: If boost exceeds this value for more than one second the JB4 will switch to low boost map 4 until the car is restarted. Note this setting has no impact on what actual boost you run. That is determined by the map selected. 1st / 2nd / 3rd gear boost limit: For cars with poor traction limiting boost in 1st gear to for example 9psi and 2nd gear to 12psi can offer your tires some relief. Default Wastegate Position (DWP): Menu 10 (0-5000rpm). The position the wastegate returns to when making less than 1.5psi of boost. Higher values can make the car feel more responsive but in some vehicles will make it more prone to "wastegate rattle". Lower values of say 800rpm are sometimes preferred to reduce rattle but might make low throttle feel more sluggish. Wastegate rattle is a hardware problem in nature and the software settings can only attempt to mask this issue. In some cases no setting can fully mask the rattle. This setting only effects performance at very low throttle input. Pedal input: Menu 11 (0-5000rpm). This determines the gas pedal's impact on the boost target. A value of 0 will target 0psi up to 45% gas pedal input while a value of 5000rpm will target 0psi up to 5% gas pedal input. Regardless of setting full boost will be targeted at 100% gas pedal input. Note that depending on your menu 12 setting you will likely make more than 0psi regardless of this setting at lower gas pedal inputs when under load. Base duty cycle: Menu 12 (0-5000rpm) and represents the minimum duty cycle to the boost solenoids. PWM will not drop below this value regardless of boost. The default setting is 2800rpm which is 28%. Going too high or low on this value may cause over/under boosting during low and partial throttle, surging, boost oscillation, and other headaches. Generally speaking this value should be set between 2400-2800rpm. FutureUseD: Various logging parameters which vary by firmware version. Refer to firmware notes for valid options. What do I need for my JB4 to anti-lag and 2STEP? For anti-lag (negative timing while building boost) you'll need the anti-lag wire kit for $15. Older JB4 systems prior to 2016 build date will also need an updated 24k22 chip for $20 which has the latest anti-lag/PI chip settings. The anti-lag wire installs within the JB4 harness allowing it to manipulate the IAT signal where we've embedded the timing changes via our back end flash maps. For 2STEP/NLS you'll need the 2STEP relay kit which includes a relay that installs within the JB4 harness and allows it to cycle power to the coils, and for manual transmissions a dedicated wire that allows the JB4 to read the clutch signal for NLS operation. Both systems require a dedicated back end flash map to allow the features to properly work together. With the latest firmware we've also added an option under Ethanol/WMI bit3 (mislabeled DTML WMI input) which allows anti-lag and 2STEP to work together for impressive results. How do I install the 2STEP/NLS add on kit for manual transmissions? Download NLS/2STEP install guide here. If I decide to get the optional DATA cable for logs and firmware updates how to I route it? Do I need to do JB4 logs? If I do logs how do I interpret them? Datalogging is a more advanced function generally only used when troubleshooting or for those who are looking to extract the most out of their vehicle. This thread contains info on what the various logging parameters mean and how to interpret them.. In addition JB4 logs can be posted in the support section if tuning advice is needed. JB4 Board Upgrades, 2STEP/NLS, DATA cables, anti-lag, and other add-ons are available are here. This is the central post for all information related to the E series N54 G5 ISO firmware! Please note that for any logs, bugs, concerns, problem reports, codes, etc, create a thread in the support section. Requests for assistance in this thread will be deleted without being read. 1) Posts to this thread that contain bug reports, logs, or tuning questions will be deleted without being read. If you need assistance post to the support forum. 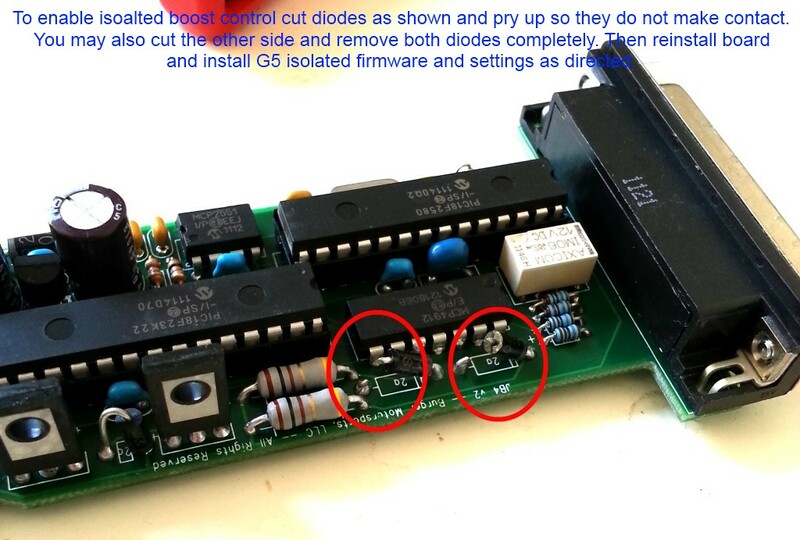 2) G5 board must have diodes removed as shown in the photo below to run this firmware. BMS started shipping all boards as ISO early 2014. We've removed the diode photo to avoid confusion but if your firmware date is 10/1/12 before updating you need to cut them off before uploading ISO firmware. Click this link for the photo. 3) For a more in depth discussion on methanol settings and how to use map 3 without methanol read here. 4) Some addl info on custom tuning the JB4 boost control..
5) If using a 3.5bar TMAP sensor set "TMAP" to 1 and if using a 4bar TMAP sensor set "TMAP" to 2. 2 - Start at normal target and failsafe IF flow drops below flow level for 1 second under boost. Enabled for all maps. 3 - When on map3 meth flow is completely ignored. Useful for using map3 as an adjustable non-meth map. bit2 - Use water temp in place of oil temp for warm up safety. bit3 - Disable open loop fuel learning. bit4 - Enable meth input Aquamist algorithm where 0-100% flow = .5v - 4.5v input. bit5 - Show bank2 fuel trims under timingAVG. 51 - Output clutch position under low fuel pressure. For troubleshooting NLS. 54 - Output 2STEP output PID under low fuel pressure. 55 - Fueling applied as a function of actual boost rather than delta over stock target. Useful for 335is models using E85 without a back end flash map. 56 - Output road speed instead of low fuel pressure. 57 - Output 4BAR learned adaption value instead of low fuel pressure. 58 - Change DB25#2 from methanol output to E85 analyzer input. 1st/2nd/3rd gear traction control. When enabled, hold volume up or channel down if you need to disable (for doing a burn out, etc). 1) Further integrated rolling anti-lag and 2STEP operation. By default both systems are independent. 2STEP is active from a stop and anti-lag is active (via volume down or brake pedal) from a rolling start. To enable the integration turn on WMI/Ethanol bit3 (mislabeled "DTML WMI Input"). Once enabled anti-lag will kick on when running 2STEP and 2STEP will kick on during rolling anti-lag. Note latest BEF maps have anti-lag timing (under IAT tables) set to -36 degrees. If you're not using one of our files make sure your flash tuner customizes your file for this change for optimal anti-lag performance. 1) Adjusted boost safety system so that boost safety for map4 (stock boost profile) change over is 3psi over map target OR 1psi before sensor runs out of range. Whichever is lower. The user adjustment boost safety setting is now used only for in dash boost gauge calibration. Boost safety won't trigger unless boost is at least 15psi. 2) Fixed another bug in the 2STEP logic. Seemed to be working much better on our development car. Let me know! 3) Changes to try to fix bug with some logging channels like IAT or oil temp dropping out. Adjustment to boost safety so it won't trigger unless boost is at least 15psi. 4) Added back map8 for valet/no boost mode. Note if NOT equipped with a BEF you may get a "boost below target" false alarm fault code when running map8. T10) For those with the 2STEP & Anti-LAG wiring installed, they are now integrated, for much louder 2STEPing fun. See "JB4_N54_NOTES.TXT" below for details on previous firmware updates. Latest update always contains all previous changes. For those running single turbo retrofit systems refer to these special notes on how to configure the JB4 for single turbo use. For those running larger hybrid turbo systems refer to these special notes on how to configure the JB4 for larger hybrid turbo systems. Note for some reason Internet Explorer will sometimes attempt to save your HEX file as an attachment.php file. Just rename it after downloading or use another browser like Mozilla. You say the PRO board is for the heavily modified. What is considered heavily modified? *********, Intake, FMIC, tune? Dammnit! there goes my shafts..might as well put the order in now. 2psi is pretty low! I can brake torque up to around 5-6psi on the G3 before I push through the brakes? That is the biggest problem with the launch mode right now. I'm going to set it up to build up boost but then close the throttle say 75%. So when you let off the brake the throttle snaps 100% open with full boost behind it. I hate you AT guys Snapping halfshafts will be the new trend. 5 more alpha systems going out today. Will bring us up to around 25 out there once they all get installed. After the holiday it transfers over to the production crew so we can start cranking out some volume. And not a moment too soon! This will work with standard transmissions, right? Alpha testing is quite a bit of work! Are you willing to run at least a dozen 1/4mile and 0-130mph runs on your car a week? And after firmware updates, doing it again, run after run to see the differences? When all is said and done, I will have well over a 100 qtr mile test runs in this test program. Yup. And I must say the 500-600 qtr mile runs I have done with a Juicebox says alot about the reliability of the platform. Alpha testing really is like having an unpaid part time job. We very much appreciate those customers willing to help! Kinda bitter-sweet for us non-alpha guys. Looking at past developments, approximately how long was the alpha period before hitting beta? Also, if Terry allows, I would love to hear some initial thoughts from the alpha people once they log some miles. Looking forward to getting into the beta! I'm fully bolt on...but no meth or upgraded turbos running 2.0 on map 7. Do I wait for the Pro, or should I just stick with the JB4? Is pro really for only the upgraded turbo/meth guys? I'd go for the G4 to tide you over. Yes, plus nitrous. It has better progressive control with nitrous and meth. Really jb4 will be fine for methanol when using cmgs fs as usual. got you....So im reading on the differences and all. And it sounds like there will be a lot more features and its got some more processing power. But what difference will I feel in terms of driving, how the car drives and power? Are the maps still going to be similar?